Few days back I saw this discussion about paid forum poster jobs, in a popular webmaster forum. Members were talking about How hard is getting a new forum going and attraction active members. They were talking about hiring paid forum posters and their prices. Some forum admins are even paying 20-50 cent average per post. It’s maybe above the average market price in my opinion. But again, it’s not a bad price if your paid forum poster is a reliable person with excellent grammar and good knowledge in niche. Also experienced guy would generate engaging topics which would create active discussions and will keep these threads alive while he/she is working on your project. This job has become a dying profession since forums are not longer popular like before. New generation is using Social media for everything. Unless it’s a really popular forum or has an authority in it’s niche it’s really hard to keep a forum active. It’s even hard to gain any financial benefits. So there isn’t a high demand for paid forum posters like it used to be. Because of this most skilled posters have moved to other areas in content creation industry. There is a high demand for Content writers and it’s more profitable too. While you get maximum 20 cents for creating a 20-30 word post you can earn $5 buy writing a 500 word article. So why should good writers waste time on earning cents ? Because of this most of the sites and services which used to offer paid forum posters are long gone. You will find old articles about this subject which showing so many sites which are dead now. 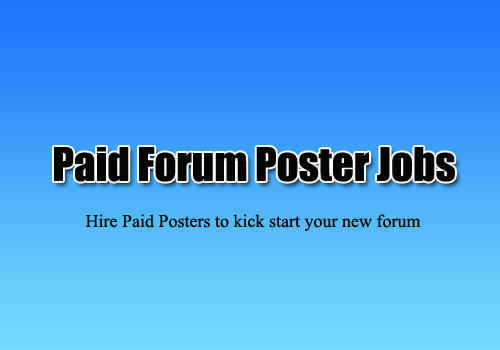 So I have decided to create a list of sites where you can hire a paid forum poster as well as you can become a forum poster. I don’t know if these sites are functioning as these used to be but at least sites are still alive. It’s worth giving it a try if you are looking for paid forum posting gigs. Another good place way hire or offer your posting service is freelancing sites. I don’t recommend you to join these forums and create a topic in market places right away. People are not that stupid and also nobody want to hire a total stranger. So it’s best to be active in all forums at least several weeks before starting a sales thread.